This tutorial shows an example of RNA-seq data analysis with DESeq2, followed by KEGG pathway analysis using GAGE. Using data from GSE37704, with processed data available on Figshare DOI: 10.6084/m9.figshare.1601975. This dataset has six samples from GSE37704, where expression was quantified by either: (A) mapping to to GRCh38 using STAR then counting reads mapped to genes with featureCounts under the union-intersection model, or (B) alignment-free quantification using Sailfish, summarized at the gene level using the GRCh38 GTF file. Both datasets are restricted to protein-coding genes only. Here I’ll use the Sailfish gene-level estimated counts. First, import the countdata and metadata directly from the web. Set up the DESeqDataSet, run the DESeq2 pipeline. # Which data do you want to use? Let's use the sailfish counts. # Filter data where you only have 0 or 1 read count across all samples. Next, get results for the HoxA1 knockdown versus control siRNA, and reorder them by p-value. Call summary on the results object to get a sense of how many genes are up or down-regulated at FDR 0.1. Since we mapped and counted against the Ensembl annotation, our results only have information about Ensembl gene IDs. But, our pathway analysis downstream will use KEGG pathways, and genes in KEGG pathways are annotated with Entrez gene IDs. I wrote an R package for doing this offline the dplyr way (https://github.com/stephenturner/annotables), but the canonical Bioconductor way to do it is with the AnnotationDbi and organism annotation packages. Here we’re using the organism package (“org”) for Homo sapiens (“Hs”), organized as an AnnotationDbi database package (“db”) using Entrez Gene IDs (“eg”) as primary keys. To see what all the keys are, use the columns function. 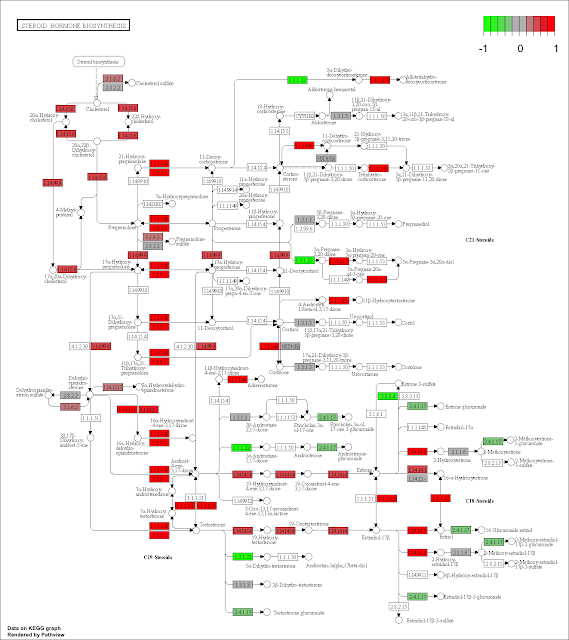 ##   "ACCNUM"       "ALIAS"        "ENSEMBL"      "ENSEMBLPROT"
##   "ENSEMBLTRANS" "ENTREZID"     "ENZYME"       "EVIDENCE"
##   "EVIDENCEALL"  "GENENAME"     "GO"           "GOALL"
##  "IPI"          "MAP"          "OMIM"         "ONTOLOGY"
##  "ONTOLOGYALL"  "PATH"         "PFAM"         "PMID"
##  "PROSITE"      "REFSEQ"       "SYMBOL"       "UCSCKG"
Let’s use the mapIds function to add more columns to the results. The row.names of our results table has the Ensembl gene ID (our key), so we need to specify keytype=ENSEMBL. The column argument tells the mapIds function which information we want, and the multiVals argument tells the function what to do if there are multiple possible values for a single input value. Here we ask to just give us back the first one that occurs in the database. Let’s get the Entrez IDs, gene symbols, and full gene names. We’re going to use the gage package (Generally Applicable Gene-set Enrichment for Pathway Analysis) for pathway analysis. 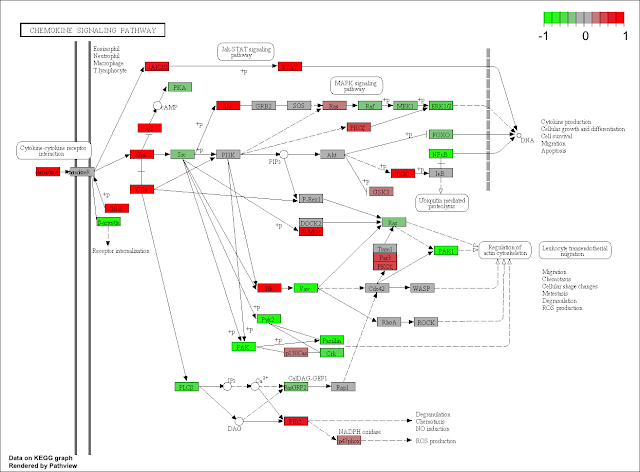 See also the gage package workflow vignette for RNA-seq pathway analysis. Once we have a list of enriched pathways, we’re going to use the pathview package to draw pathway diagrams, shading the molecules in the pathway by their degree of up/down-regulation. The gageData package has pre-compiled databases mapping genes to KEGG pathways and GO terms for common organisms. kegg.sets.hs is a named list of 229 elements. 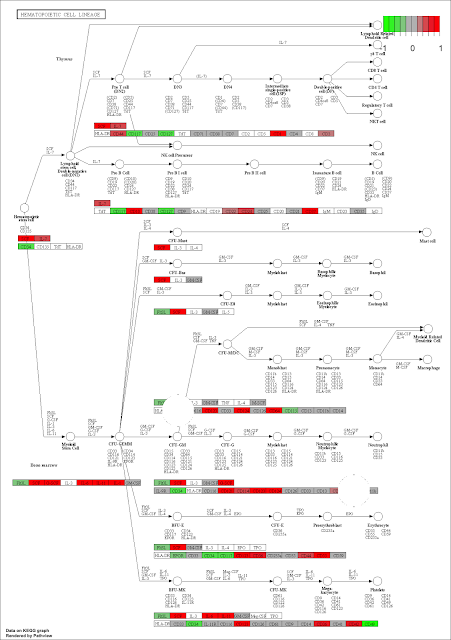 Each element is a character vector of member gene Entrez IDs for a single KEGG pathway. (See also go.sets.hs). sigmet.idx.hs is an index of numbers of sinaling and metabolic pathways in kegg.set.gs. 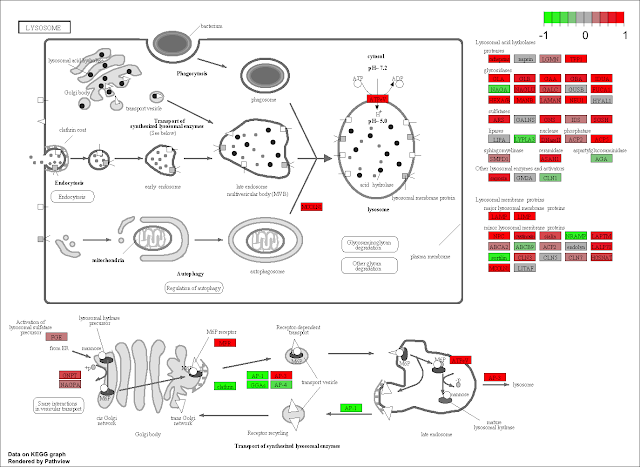 In other words, KEGG pathway include other types of pathway definitions, like “Global Map” and “Human Diseases”, which may be undesirable in pathway analysis. Therefore, kegg.sets.hs[sigmet.idx.hs] gives you the “cleaner” gene sets of sinaling and metabolic pathways only. ##  "10"   "1544" "1548" "1549" "1553" "7498" "9"
##   "10"     "1066"   "10720"  "10941"  "151531" "1548"   "1549"
##   "1551"   "1553"   "1576"   "1577"   "1806"   "1807"   "1890"
##  "221223" "2990"   "3251"   "3614"   "3615"   "3704"   "51733"
##  "54490"  "54575"  "54576"  "54577"  "54578"  "54579"  "54600"
##  "54657"  "54658"  "54659"  "54963"  "574537" "64816"  "7083"
##  "7084"   "7172"   "7363"   "7364"   "7365"   "7366"   "7367"
##  "7371"   "7372"   "7378"   "7498"   "79799"  "83549"  "8824"
##    "100"    "10201"  "10606"  "10621"  "10622"  "10623"  "107"
##    "10714"  "108"    "10846"  "109"    "111"    "11128"  "11164"
##   "112"    "113"    "114"    "115"    "122481" "122622" "124583"
##   "132"    "158"    "159"    "1633"   "171568" "1716"   "196883"
##   "203"    "204"    "205"    "221823" "2272"   "22978"  "23649"
##   "246721" "25885"  "2618"   "26289"  "270"    "271"    "27115"
##   "272"    "2766"   "2977"   "2982"   "2983"   "2984"   "2986"
##   "2987"   "29922"  "3000"   "30833"  "30834"  "318"    "3251"
##   "353"    "3614"   "3615"   "3704"   "377841" "471"    "4830"
##   "4831"   "4832"   "4833"   "4860"   "4881"   "4882"   "4907"
##   "50484"  "50940"  "51082"  "51251"  "51292"  "5136"   "5137"
##   "5138"   "5139"   "5140"   "5141"   "5142"   "5143"   "5144"
##   "5145"   "5146"   "5147"   "5148"   "5149"   "5150"   "5151"
##   "5152"   "5153"   "5158"   "5167"   "5169"   "51728"  "5198"
##   "5236"   "5313"   "5315"   "53343"  "54107"  "5422"   "5424"
##  "5425"   "5426"   "5427"   "5430"   "5431"   "5432"   "5433"
##  "5434"   "5435"   "5436"   "5437"   "5438"   "5439"   "5440"
##  "5441"   "5471"   "548644" "55276"  "5557"   "5558"   "55703"
##  "55811"  "55821"  "5631"   "5634"   "56655"  "56953"  "56985"
##  "57804"  "58497"  "6240"   "6241"   "64425"  "646625" "654364"
##  "661"    "7498"   "8382"   "84172"  "84265"  "84284"  "84618"
##  "8622"   "8654"   "87178"  "8833"   "9060"   "9061"   "93034"
##  "953"    "9533"   "954"    "955"    "956"    "957"    "9583"
The gage() function requires a named vector of fold changes, where the names of the values are the Entrez gene IDs. Now, let’s run the pathway analysis. See help on the gage function with ?gage. Specifically, you might want to try changing the value of same.dir. This value determins whether to test for changes in a gene set toward a single direction (all genes up or down regulated) or changes towards both directions simultaneously (any genes in the pathway dysregulated). For experimentally derived gene sets, GO term groups, etc, coregulation is commonly the case, hence same.dir = TRUE (default); In KEGG, BioCarta pathways, genes frequently are not coregulated, hence it could be informative to let same.dir = FALSE. Although same.dir = TRUE could also be interesting for pathways. Here, we’re using same.dir = TRUE, which will give us separate lists for pathways that are upregulated versus pathways that are downregulated. Let’s look at the first few results from each. # Look at both up (greater), down (less), and statatistics. Now, let’s process the results to pull out the top 5 upregulated pathways, then further process that just to get the IDs. We’ll use these KEGG pathway IDs downstream for plotting. ##  "hsa04640 Hematopoietic cell lineage"
##  "hsa04630 Jak-STAT signaling pathway"
##  "hsa00140 Steroid hormone biosynthesis"
##  "hsa04062 Chemokine signaling pathway"
##  "hsa04142" "hsa04640" "hsa04630" "hsa00140" "hsa04062"
Finally, the pathview() function in the pathview package makes the plots. Let’s write a function so we can loop through and draw plots for the top 5 pathways we created above. We can also do a similar procedure with gene ontology. Similar to above, go.sets.hs has all GO terms. go.subs.hs is a named list containing indexes for the BP, CC, and MF ontologies. Let’s only do Biological Process. This post is almost scarily timed. Just this week I was struggling to do exactly this kind of analysis, in DESEQ, using Sailfish counts. Thanks for the help, Stephen! Amazing, I am new to this kind of analysis. I echo the scary timing. I'm putting together a workshop on RNA-Seq, and thought "Should I work on an example, or should I procrastinate and read some blogs?" Thank you! Also see http://bioconnector.org/workshops/ws-rnaseq-1day/ and the source material on github. I got error when I run the pipeline of your Tutorial. Could you help me in solving this problem? you probably need the dplyr library loaded. I really have loaded the dplyr library. Is the following lines that led to the error? The problem is still there, even I loaded "dplyr". Do you have more advice for me? Thanks. Try to reinstall pathview again. I got the same error. Reinstalling helped. I got the same error, but detaching dplyr worked for me. I just added the command suggested by Stephen to detach it in my script, ran the sapply, then re-attached dplyr afterwards. Looks like maybe dplyr's 'select' command overwrites the 'select' used by pathview. Many thanks for sharing the commands. What about the transcription factor binding sites. Is there any package in R, we can load data directly from DeSeq2? Like what you explained for KEGG and GO terms? I found the pathway analysis (KEGG) not only including significant DE genes but also those non significant genes. Why not excluding those not significant?